Citation: Renju Thomas Jacob, Zohra Aziz Ali Manjiyani, Keerthan Kumar.R, Prof. Kathrivelan.J. (2014). 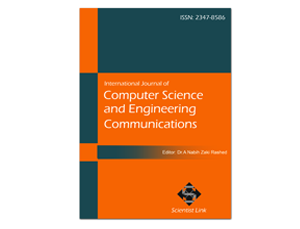 Development of MEMS Based 3-Axis Accelerometer for Hand Movement MonitoringInternational Journal of Computer Science and Engineering Communications,Vol.2,Issue.1,pp.87-92. This project develops a hand movement monitoring system, which feeds the data into the computer and gives the 3D image rotation according to the direction of the tilt and hence monitoring the movement of the hand in context to its tilt. Advancement of MEMS Technology has enabled us to get very small and low cost accelerometer ICs which is based on capacitive principle. Accelerometer based Tilt sensor ADXL335 is used in this paper, based on MEMS technology and the project emphasis on the development of the MEMS based accelerometer to measure the tilt, interfacing the hardware with the LabVIEW and showing the 3D rotation to the user, which is in his understandable form and tilt data can be saved in the computer. It provides an experience of working on emerging technologies like MEMS and design software like LabVIEW. With modern nanotechnology, it is now possible to bring sensors, their signal conditioning and processing circuits on single silicon based platform. The technology used for this purpose is called as micro electro mechanical (MEMS) system. Due to its small size and ease of operation, MEMS accelerometer sensor is commonly used in gaming applications to enhance the effect, mobile handsets, even implemented on human body to analyse tremors and other physical activities. The 3 axis accelerometer is based on the principle of capacitive sensing. The fig.1 shows basic principle of accelerometer sensor. The sensor is made of spring loaded, micro machined structure, mounted on silicon base. Force on the structure changes the position of seismic mass attached on the spring. This deflection is measured using fixed plate capacitor sensors. The change in acceleration unbalances capacitor plate distance, observed by modulation/demodulation circuits and thus, resulted in output proportional to acceleration. The sensing can be static (gravity) or dynamic (forced acceleration). To test the accuracy of the accelerometer tilt measurements, the accelerometer is tilted in various angles in all direction. The data was read through LabVIEW and stored in a text file. The results obtained are as follows. The fig. 2 shown below is the interfacing of the ADXL335 with the Ni DAQ cards. L. Zhao, E. M. Yeatman (Optical and Semiconductor Devices Group, Department of Electrical & Electronic Engineering, Imperial College London, SW7 2AZ, UK). Micro Capacitive Tilt Sensor for Human Body Movement Detection. Zhenchuan Yang*, Guizhen Van, Yilong Hao, Guoying Wu( Institute of Microelectonics, Peking University, Beijing 100871, China). Design and Fabrication of a Torsional Z-axis Capacitive Accelerometer with Novel Com b Capacitor. Tolga Kaya,Behrouz Shiari, Kevin Petsch1 and David Yates (Central Michigan University, University of Michigan). Design of a MEMS Capacitive Comb drive Accelerometer. Sam Naghshineh, Golafsoun Ameri, Mazdak Zereshki, Dr. S. Krishnan & Dr. M. Abdoli-Eramaki. Human Motion capture using Tri-Axial accelerometers.